Interview with Susan Swain. · One Book. One Author. One Hour. 01:08 – Booknotes evolved from the Neil Sheehan book Bright Shining Lie. C-SPAN found that there was enough interest in book-related programming to continue doing it. 2:40 – Books were chosen per Brian Lamb's interest with some input from the program's producers. There were many more bookstores back in the late 1980s and 1990s, so it was easier to browse books then. 3:56 – The original idea was one book, one author, one hour. There were no commercial breaks, so that it was easier for a viewer to get comfortable with an author and their book. 5:00 – The simplicity of the set was important so as to put more emphasis on the author and harken back to the early and simpler days of television. 06:30 – Brian's interview style was thorough preparation (sometimes enough for an author to be stumped about their own book by Brian Lamb). Brian Lamb tried to get out of the way and let the author do the talking. This is the C-SPAN style for other hosts. 09:40 – Brian gave each author equal amounts of care in their interview. He read and prepared meticulously. 10:40 – The hour-long programming was a marketing hook. Booknotes was established as the "anchor" program for the network. It developed its own audience. It allowed audience members to be conversant in the books. 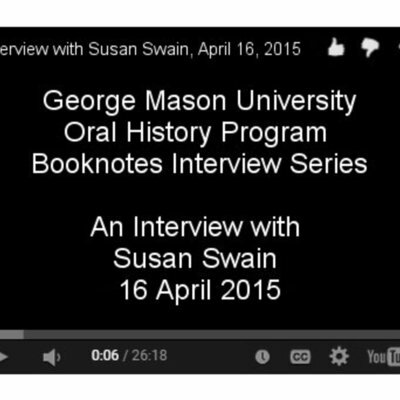 12:30 – Susan Swain has been involved in all seven of the books about Booknotes and the other book-related programs. The books were based upon the transcripts so as to present the author's own speaking style. Each book had a Booknotes-related theme to it. 17:00 – Swain related authors she remembered for their interesting writing styles. Every author has a system. Writing is not easy. 18:58 - Swain was not surprised about the popularity of Booknotes. She was pleased by it, though. Booknotes showed that C-SPAN is more than just congress. 20:02 - Booknotes captured an important period in American history. The books on the program documented this period. Authors are remembered for being on Booknotes. Gave C-SPAN a permanent toe-hold in the world of non-fiction books. 23:00 - Booknotes finally ended when Brian Lamb decided that the program and the reading for the program had consumed his entire life. They decided to end it in December with a book on reading, which made the 801st book. 25:00 - Swain has hopes for the Booknotes book collection and C-SPAN records. She hopes that researchers will be able to make scholarly use of the collection. Lindsey Bestebreurtje, “Interview with Susan Swain.,” One Book. One Author. One Hour., accessed April 24, 2019, http://booknotes.gmu.edu/items/show/3093.